====Goals: mixing system to achieve homogeneous mixing and confined liquid or gaseous fluids; ====Usable in: chemical and pharmaceutical industries, agricultural and food industry, anaerobic digestion industry, cultivate algae, sewage and water treatment industry. ====All IP set: Link . ====Device and Method for the homogeneous and delimited mixing of fluids, both liquid and gaseous, forming part of a fluid mass in motion or in state of rest. The method comprises: â€¢ taking part of the material from said fluid mass; â€¢ making a vigorous mixing of the fluid material taken; â€¢ reinserting the fluid mixed material into said fluid mass; The device (A, B) comprises: â€¢. a first manifold (1, 10), closed at both ends, on which a first plurality of holes (la, 10a) is made, aligned along a generatrix of said first manifold (1,10); â€¢. a second manifold (2, 20), closed at both ends, on which it is made a second plurality of holes (2a, 20a) aligned along a generatrix of said second manifold (2, 20); â€¢ Â· a pipe (3, 3a) that connects said first manifold (1, 10) with said second manifold ( 2, 20); â€¢ Â· pumping means (4), inserted in said pipe (3, 3a), which cause a movement of a fluid contained in said pipe (3, 3a) by said first manifold (1, 10) towards said second manifold (2, 20). 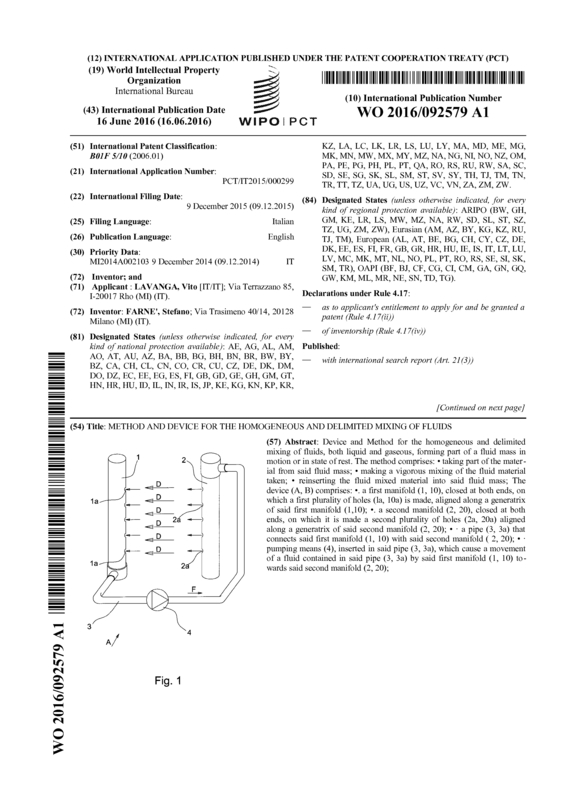 Page created at 2019-04-25 0:01:37, Patent Auction Time.